The centre, which was widely marketed via digital marketing, online advertising, press adverts as well as YouTube postings, attracted interest from all parts of the country and neighbouring countries alike, including a strong contingent from China. According to Andrew Miller, the auctioneer who conducted the sale, bidding was measured and steady until the final bid went the way of popular businessman, Mr Freddy Schoonhoven. “The centre, which has a gross annual income of close to R20 Million, was sold at a calculated yield of 11.5%”, said Miller who further added that he was “happy that Mr Freddy Schoonhoven bought the property because he lives in Richards Bay and is very familiar with all that happens in this prominent area. This successful sale underpins the value of selling a sought-after property by way of auction. As an auctioneer, I have been involved with many different sales but this is the largest single property transaction that I have had the pleasure of selling under my gavel”. Andrew Miller concluded by saying, “The auction of this very popular centre offered investors looking for value beyond metropolitan areas a great opportunity. Strong national tenants and location are prerequisite variables for major property buyers when looking at busy outlying towns and the Richards Bay Taxi City centre is just the type of property which ticked all of these boxes”. 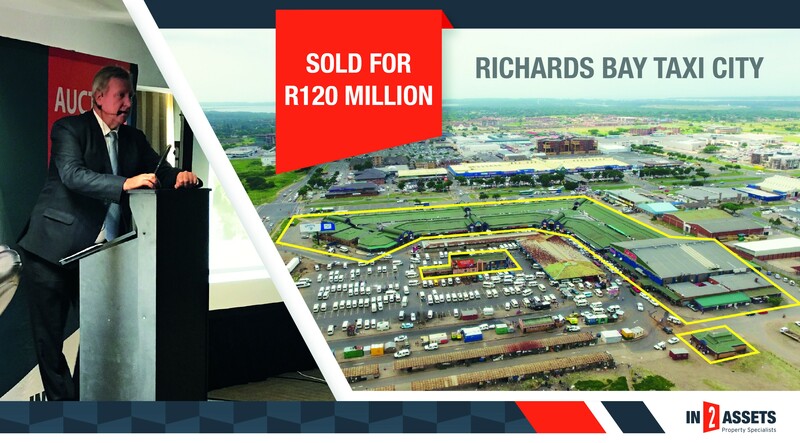 The sale of the Shopping Centre joins the ranks of the Harrismith Bergview Complex, which was also sold by In2Assets for R95 million, as the highest ever sold on auction by the professional In2Assets team. In2Assets focuses primarily on Commercial, Industrial & Agricultural properties on a national basis and have sold in excess of R1 Billion worth of commercial properties over the last 5 years. The next KZN auction of a multitude of investment properties takes place on the 27 June 2017 at the Durban Country Club.